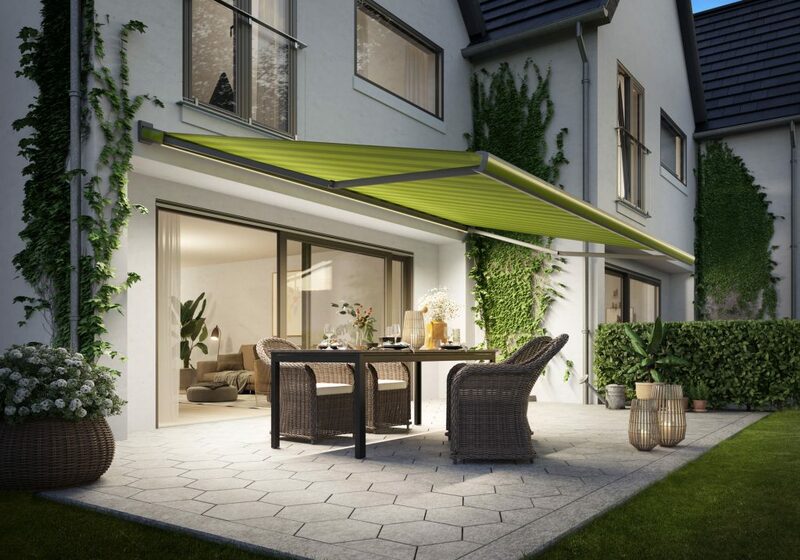 New from German awning manufacturer Markilux is the MX-3, an awning that showcases the very best in modern awning design and technology in 2019. 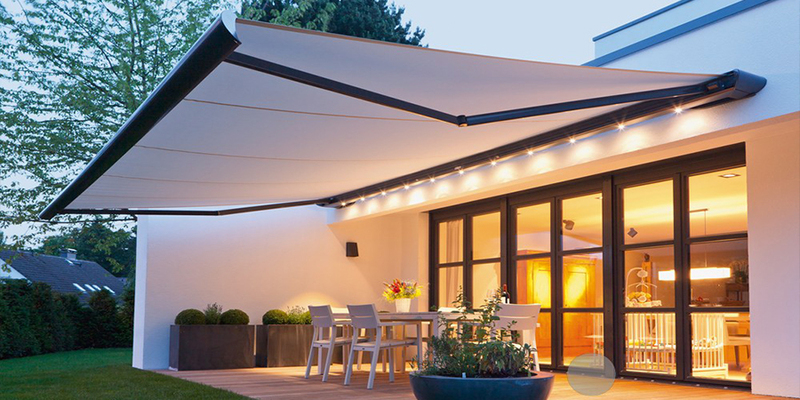 Markilux are renowned as one of the best awning manufacturers in the world, if not the very best. 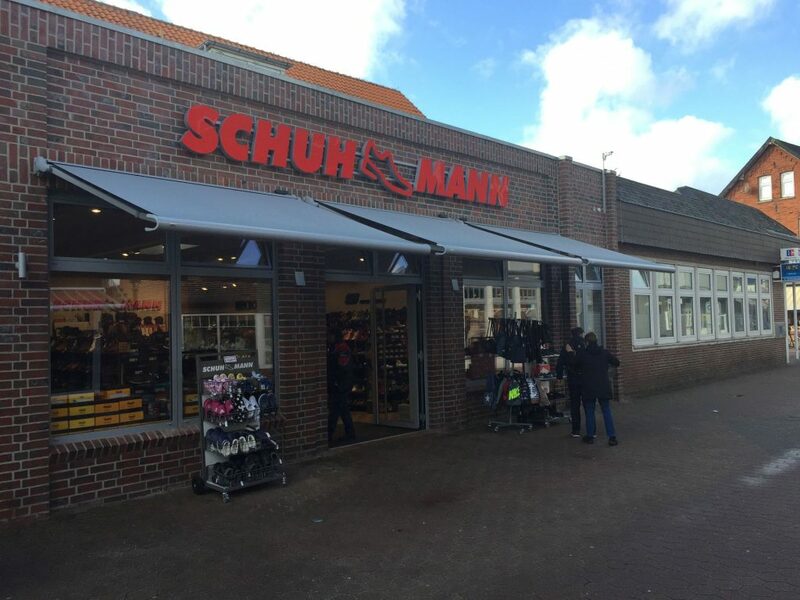 Based in Germany, all of their awnings are tested in the northern German climate, one that is similar to ours in Britain. 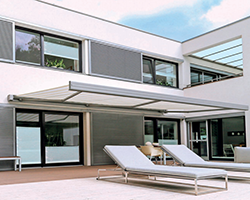 Markilux manufacturer everything from the mechanisms to the fabrics, which are perhaps the best you will find on awnings anywhere in the world. This commitment to high quality products and innovative design has lead to Markilux being awarded multiple awards, including the iF Design Awards and Interior Innovation Awards. 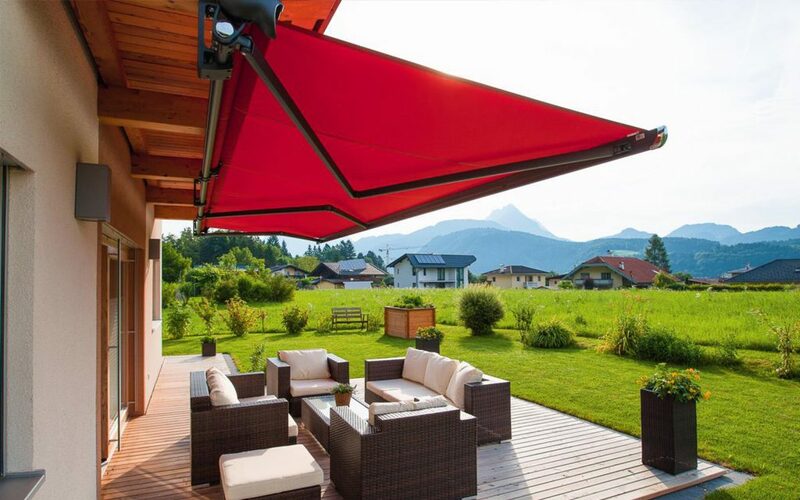 From their fantastic designs to their high standards of reliability and build quality, Markilux are rightfully one of the biggest and best awning manufacturers on the market. The MX-3 takes these elements and showcases them all in one retractable cassette awning. The design of the cassette itself is unique and unlike anything else you will see. The compact cassette is unobtrusive, and the awning design as a whole combines powerful clear lines with attractive curves to create a truly unique and breath taking appearance, whilst the huge customisation options for both the awning and cassette itself mean that the MX-3 can truly fit in on a number of properties. The MX-3 comes in a massive range of colours. Eight different colour designs are as standard, ranging from an eyecatching Sulphur Yellow or a spectacular Traffic Red, to a more subtle Pearl White or Agate Grey. These can however be changed for any RAL colour at all for maximum individuality. 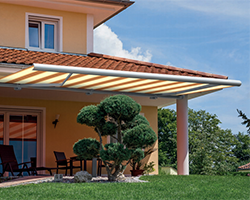 The Markilux Mx-3 cassette awning can have two different sorts of LED lighting, helping to keep your outdoor area illuminated and extending its usability. It can either have a recessed LED line or LED spotlights inside the cassette. For more information on the brand new Markilux MX-3 cassette awning, please visit our product page by clicking here, or call us and speak to one of our knowledgeable experts who will be able to answer your questions. 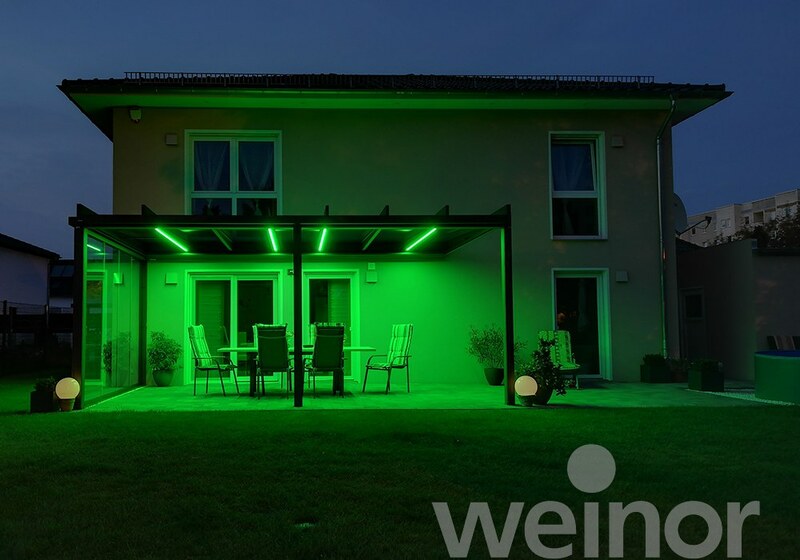 Now available from German awning and glass roof manufacturer Weinor is the brand new accessory for their verandas and glass rooms, LED RGB strip bars. 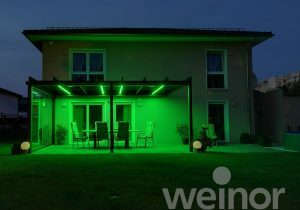 These coloured LED bars aim to help you create the perfect ambience. There is a massive choice of 48 different colours, plus three different varients of white. This helps to create a variety of atmospheres, from a calming blue tone, or an energising red, to a more normal white colour. This allows you to create the perfect atmosphere for your mood or need. Meanwhile, the subtle and aesthetically pleasing framing itself can be any of 200 colours. 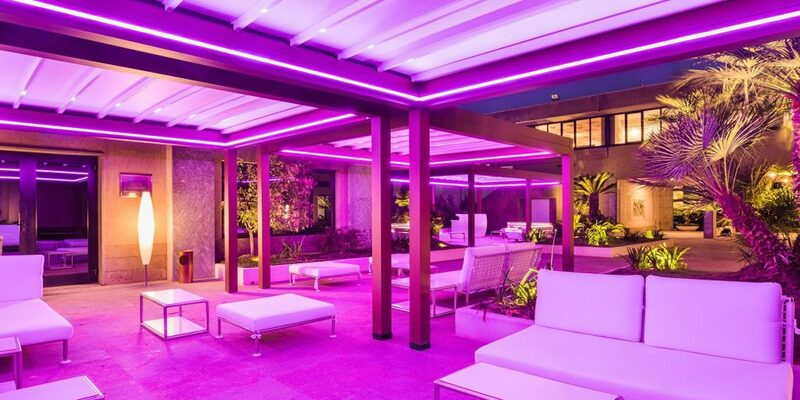 Like all LED lights, the RGB strip lighting is extremely energy efficient, with 30% less energy being consumed when compared to more traditional lighting, helping you save on your electricity bills whilst creating a more stylish outside area. Operation of the LED lighting strips couldn’t be easier, with the BiEasy 15M Go! hand transmitter controlling all functions, allowing you to create the perfect lighting situation at the press of a button. These can be utilised in multiple ways, from being attached to a house wall, to various different Weinor products and can installed quickly, easily and flexibly. For more information, contact us, or view the PDF. 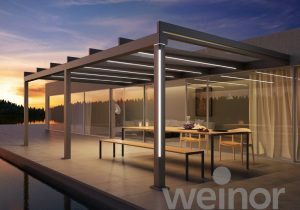 The Terrazza Pure, an exciting new 90° glass roof system from Weinor, will now be coming to the UK and Samson Awnings later this year. A new free-standing roof system from Weinor, the Terrazza Pure is a brilliant sun and weather protection system from the innovators at Weinor. Usable as either a free standing or lean-to system, meaning it can either be constructed to attach onto an existing wall or structure, or be made to stand independently itself. 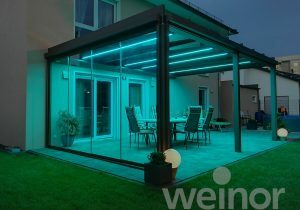 It has a cubic design, with special lighting and decorative strips that ensure this system looks fantastic wherever it is erected, and with a large range of features, it can be customised to suit whatever needs you may have. 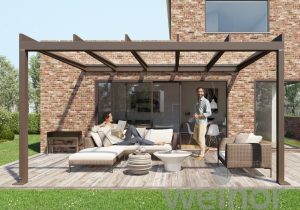 The Terrazza Pure is based upon the already existing Terrazza. Weinor have took this model and converted it to a cubic design, allowing it to be a truly free standing system. The system uses a cubic design, whilst rainwater is drained via the guttering down the posts. LED strips are available to provide lighting, available in up to 48 colours and three different types or white. The colours can even be dimmed or adjusted via the Weinor transmitter. The sides can be filled in too, with the options for either vertical blinds, glass sliding doors or glazing, enabling you to fully close off the system and convert it into an outdoor room. When it comes to preventing excessive heat and glare from the sun on South and West facing windows and doors there are several options available, some of which you may not have considered. The trick with preventing solar heat gain is to prevent the sunlight hitting the glass of your windows, doors or bi-folding doors. Internal blinds of various types only stop sun glare and do not stop the heat entering the building. Using various fabric and solid metal blinds and awnings externally can provide the perfect solution and provide some vision where required to the outside. Samson Awnings offer a wide range of purpose made products which are generally suitable for commercial or domestic use on any property covering very large doors and windows if required. External Zip or Wire guided Fabric Vertical Blind. Yes, that’s right an external fitted fabric blind to provide proper protection from the heat and glare of the sun but also provide protection from wind and rain if necessary. 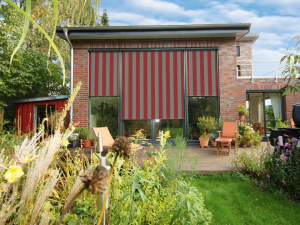 The very latest ranges of external blinds offer by Samson are designed to be other gravity fed or cable and motor power driven with a zip channel system to the sides to ensure the greatest tension in the fabric itself when closed. The choice of fabrics is huge and there are also perforated options to provide some vision and ventilation even when closed but still able to provide protection from driving rain and diffuse the sunlight too. For true weather protection and controlling sunlight and heat gain look to fitting blinds externally and benefitting far more in all round control of sunlight, wind and rain ingress. If you have sliding or inward opening windows then you can have the windows open and the blinds down to act as the weather protection, especially in the hotter months of the year. A retractable awning can be used for either providing protection for an area underneath but also for protecting doors and windows from sunlight, especially those facing West and South which can suffer from low lying sun in the Autumn months. Our awning range is huge, and all the awnings are made to measure with sizes up to 14m wide and 4m projection with a fully adjustable angle for the fabric cover to ensure the best protection when extended out. 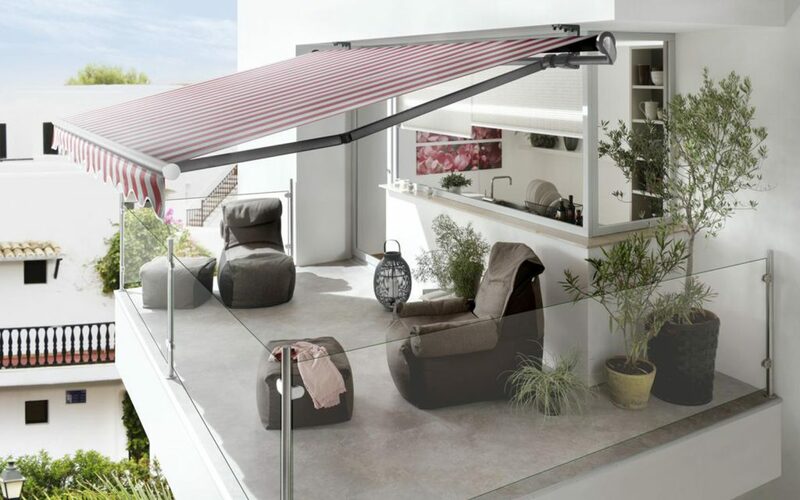 Whether manual or electric operation, a good quality awning will provide shade for your doors and windows but also can provide a prefect space underneath to help define an outdoor area for your patio, garden or terrace to entertain family and friends. A traditional method for window shading this simple awning will drop down and provide a fabric protection cover at a 45-degree angle with a small protective cassette for the fabric and roll mechanism. The side arms provide the stability when opened and some models will allow the fabric to drop almost all the way down to 180 degrees acting like a normal blind to protect the whole window or door. Drop arm awnings are a great solution as they are lightweight and don’t require the fixings like a self-supporting retractable awning does. The cassette is small containing the fabric and the system is stable in wind because of the mechanics. With Christmas over and the January sales winding down, this is perhaps the first time this year that you have had to take a step back and look at your shop. One question you may be wondering is if it is worth getting an awning or replacing your current one. Here, we will outline the benefits or doing just that, and how they improve more than just the aesthetics of your business. Over time, older awnings may have gotten worn, faded or damaged. This is of course a natural problem with most older awnings, whilst most modern awnings are capable of dealing with the effects of harsher weather. Faded and worn signs often put people off from entering a shop, as we naturally judge a shop from the outside before we enter it. 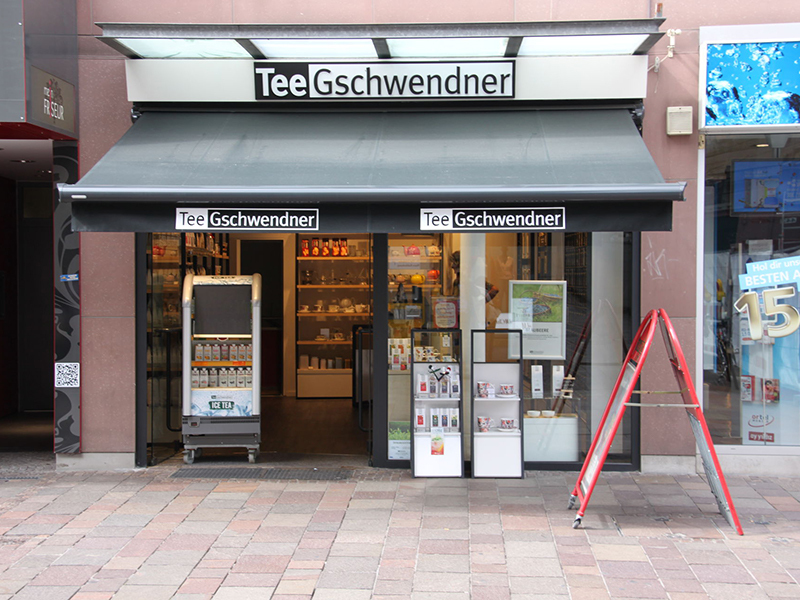 A new awning can completely change the appearance of your shop, making it immediately more inviting to potential customers, enticing passing trade. One of the strong points of an awning from Samson Awnings is the ability to personalise it with your shops own branding. With most awnings it is possible to have any RAL colour, and branding is also possible. 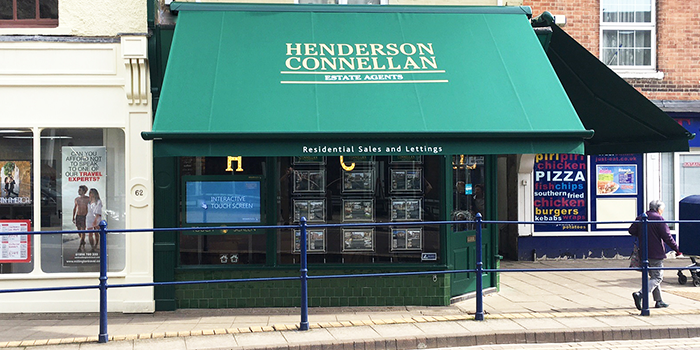 This means you can have your logo and colours on the awning, extending your presence on the high street and making yourself more visible, as well as further the cohesion and strength of your brand. 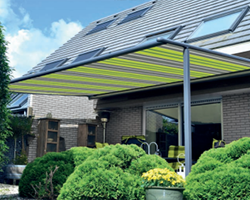 With the weather becoming more extreme over time, as Winters become colder and wetter and summers becoming warmer, awnings and other forms of protection could become more important. Whilst we are now in late January, Summer will arrive before we know it, and it is important to prepare accordingly. An awning will not just protect you in wet weather, but will also stop your premises from becoming unbearably hot during the summer. Extending an awning in warm weather can stop the burning summer sun from warming up the glass in the windows of your shop, therefor keeping the whole building cooler, and encouraging shoppers or visitors to stay longer. Standing out as a business is getting more important by the day, as competition has never been fiercer. So what can you do to get the edge on your neighbouring businesses? One of the biggest benefits an awning has is that is can be personalised or branded. This allows you to extend your presence on the high street and stand out compared to your peers. Physically standing out from your competitors provides a massive boost and is more likely to attract new customers and visitors. A branded awning can be a very impressive addition to your property. When done well, it can provide a massive boost to your businesses aesthetics. With space at a premium in busy city centres or high streets, maximising your space has never been so important. Because of this, a lot of different businesses are looking for ways to make the most of their outdoor areas to maximise revenue. Awnings help to allow use of your outdoor spaces even in trickier weather conditions by protecting your customers or visitors from rain. 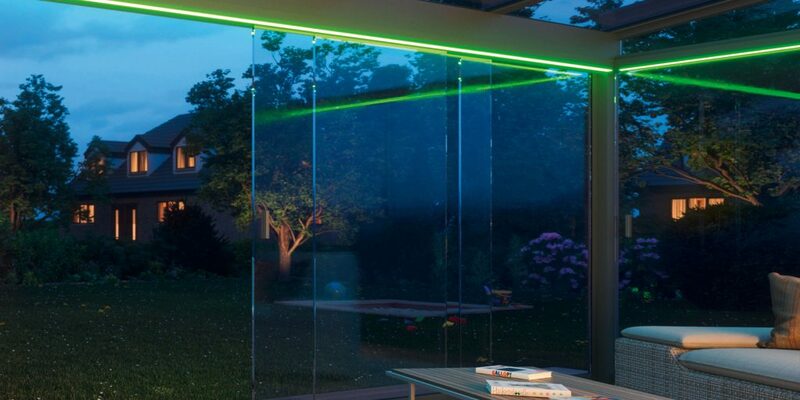 Alongside this, combined with LED lights or infrared heaters you can extend the usability of your outside space further into the night time and even during the colder months. This allows for more space for customers and the chance to maximise revenues at all times for a relatively small amount of money. 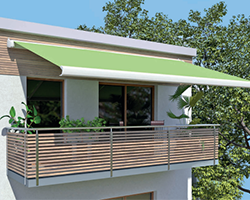 Of course, one of the biggest benefits of an awning is simply the weather protection it will provide to those both inside and outside the property. Keeping those underneath dry and protected is a massive benefit, allowing for additional seating, as well as keeping the pavement or path underneath it dry and less slippy. Not only this, but awnings have been shown to have a positive effect on passing trade, with customers more likely to stop outside under an awning and look in the window of the shop. One of the effects often forgot about is actually the effect awnings can have in warmer summer weather, where they stop the hot sun from warming up the glass and making the room inside unbearable. From shops to offices, this can have a massive benefit for both visitors and members of staff, helping increase productivity by relieving uncomfortable weather conditions. 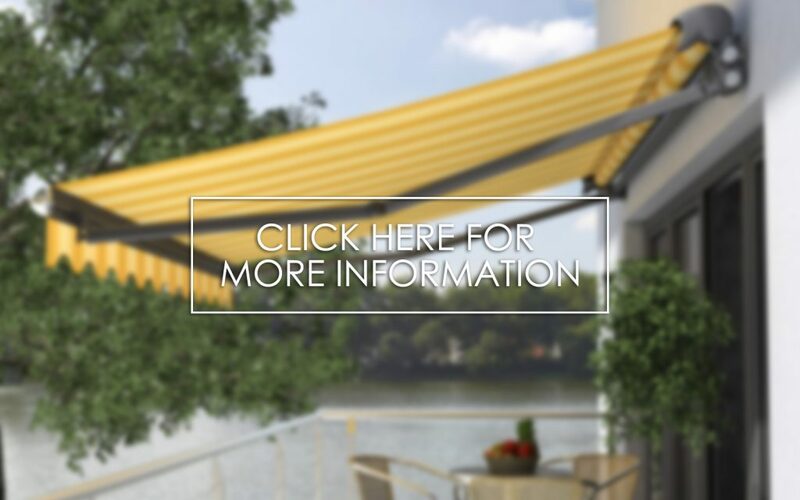 With a wide variety of possibilities, it can be daunting to purchase a new awning for those unfamiliar with the product itself. From different styles, makes, models and more, it can understandably seem like an overload of information. We are commonly asked what the difference between an open, semi and full cassette awnings are, and what their different uses can be. In this short piece, we hope to make the difference between the three styles clear and examine the different uses for them in both domestic and commercial settings. The cassette itself is the casing which houses the fabric, mechanism and arms, and provide protection against the elements. A full cassette provides complete protection when the awning is fully retracted and this makes it perfect for shops, cafes and more, as well as being the ideal cassette type for the notoriously changeable British weather. This is the ultimate protection for the awning and whilst this is certainly reflected in the prices, the safety and reliability of these, as well as the impressive aesthetics, make them extremely popular. An open cassette meanwhile provides no external casing to protect from the elements for the arms or fabric, however a protective top cover can sometimes be added. 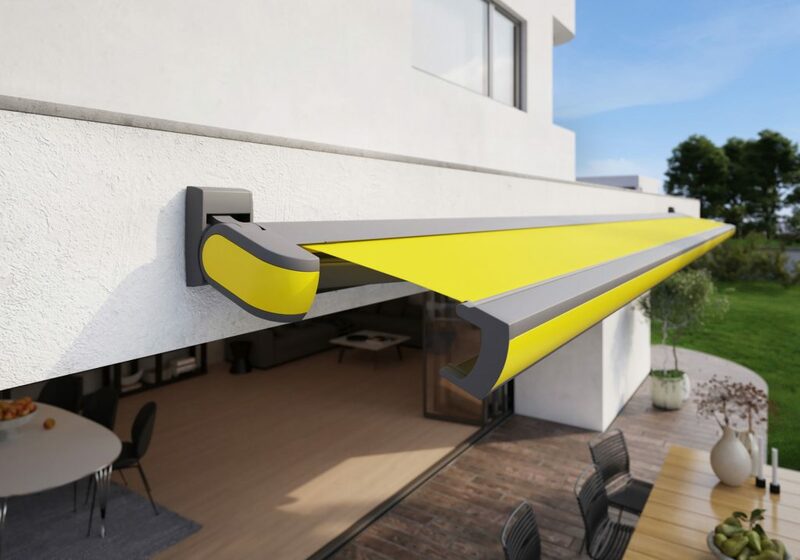 The lack of casing means these are best suited to areas involving an overhang, however the lack of casing means these can often span far greater areas than cassette awnings, and are also usually less expensive too. A semi cassette awning contains a top that is protected by casing that will protect from a certain amount of weather damage. They can also have additional guards added to enhance protection. These are useful as a mid point between the full and open cassette awnings. As a general rule, all of these awnings are suitable for both commercial and domestic applications, but they have specific strengths and ensuring you have the right awning for your needs and property is crucial. 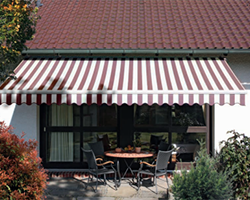 With such stark differences between the three kind of awnings, they are understandably useful for various purposes. A full cassette awnings like the Markilux 990, are without a doubt the best awning for an all year round protection system, and they look fantastic, with a range of designs aimed to ensure there is always an awning that will suit your property. With the British weather notoriously changeable, these offer full protection and reliability. The cassette however does limit the sizes possible due to the need to fit the arms into the cassette. If your property is exposed to the elements, a full cassette awning is definitely the best option. Semi cassette awnings are a little more diverse than full cassette awnings, and are a little cheaper too due to the lack of a full casing. Whilst this has benefits beyond price and adaptability, it should be noted that you do not have full protection for the fabric and mechanisms, and this can be an issue in adverse weather conditions. 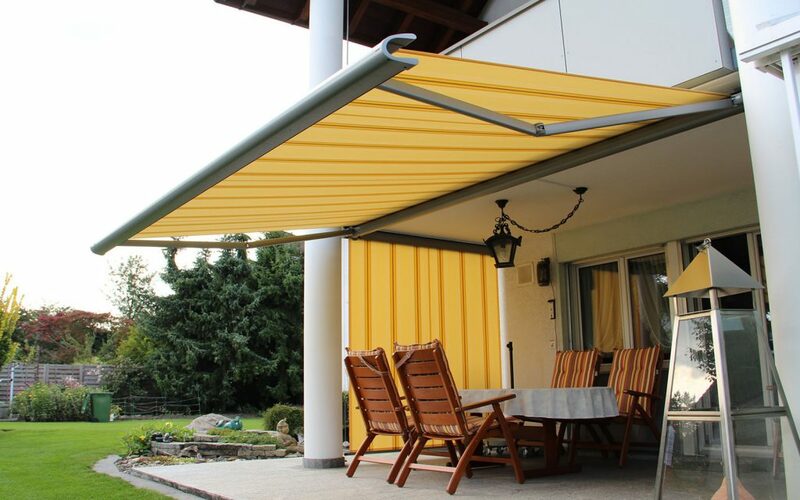 The lack of a full cassette also means that these can have extended arm sizes, meaning these are an excellent option for properties needing to cover larger spaces with only a little cover for the awning. Open cassette awnings, such as the Markilux 1700, are completely unprotected, with no casing at all for the fabric and mechanism. This of course means these awnings suit drier climates or properties with alcoves and overhands to protect them from the weather. The benefits of these however are the ability to cover greater projections than the width due to lack of casing, as well as being noticeably less expensive. These are fantastic for enclosed spaces or large open areas with an alcove or overhang. 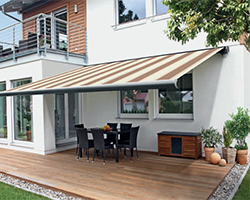 Coming soon to Samson Awnings is a range of products by German manufacturer Erhardt Markisen. 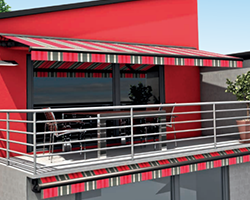 Amongst the products are a range of high quality retractable awnings and a glass roof terrace system. Founded in 1980, Erhardt Markisen started as a one man operation. Over the last 38 years the company has grown exponentially, and for the past 10 years they have been designing and manufacturing terrace roofs and glazing solutions at their Burtenbach site in the German region of Bavaria. Focused on high quality products and innovative ideas, Erhardt are a well known and respected name within the industry. They pride themselves on having fast and reliable deliveries and knowledgeable staff. All fabrics undergo strict testing, both in the sewing room and the weaving plant. The current range of materials spans to over 250 different fabric designs across seven collections. A proven cassette awning that impresses right down to the smallest detail. Modern Bauhaus design incorporating the best in technical advances and LED Lighting. 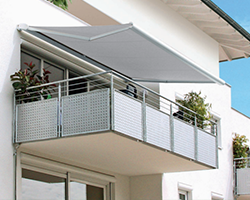 A high-performance cassette awning with sophisticated technology & a low-profile design. As the summer winds down and we head into the Autumn, we face the possibility of another long and harsh Winter. Climate change has left many scientists warning that the previous 12 months of extreme weather could become the norm for these isles, and so the need to adapt whilst being energy efficient is one of the average household’s most pressing challenges. So what can you do to save energy and how can we help you? Led lights are a big energy saver, using up to 75% less energy than their comparable halogen equivalent, and need replacing less often. Many of our systems such as Markilux awnings, Weinor retractable roofs or Gibus Med Systems have LED lighting as an option, and this is something that could be extended through your home. While LED lights save money and conserve energy, they are also very bright, and are even available in a variety of colours, with remote controls available for some LED lights which allow you to change colour, have them alternate or even set up patterns. External shades are an often overlooked way to save money in the long run in warmer climates. During hot summers like the one we have just experienced, it can be difficult to cool down a property when the sun in beating down on the windows, cooking the room on the other side. External shades allow you to prevent the sun from reaching the glazing and therefor stop the room from being heated without the use of fans or air conditioning, saving money and conserving energy. This is something that is going to become more important in the UK as climate change takes effect, and therefore is something that more households will need to consider than ever before. Similarly, retractable awnings do a similar job, whilst also offering a larger shaded area outside for you to relax. Markilux are a world leader in awnings and blinds, and vertical blind products such as the 710/810 and 750/850 or awnings such as the 990 being perfect for this purpose. Infrared heating has many strengths over standard heating. It requires almost no warm up time and provides instant heating, making it perfect for outdoor use. Infrared heating uses electromagnetic radiation, however it is 100% safe (our bodies actually emit infrared radiation, which is how things such as night vision goggles work). It is a different heat to our usual heating systems, which heat the air which comes into contact with it. Infrared heat meanwhile, travels through the air until it hits a solid object, at which point the object absorbs the heat. In people, this gives a deep feeling of warmth. Because of this targeted heating, they conserve a lot of energy compared to conventional heaters and this can help you save more money. 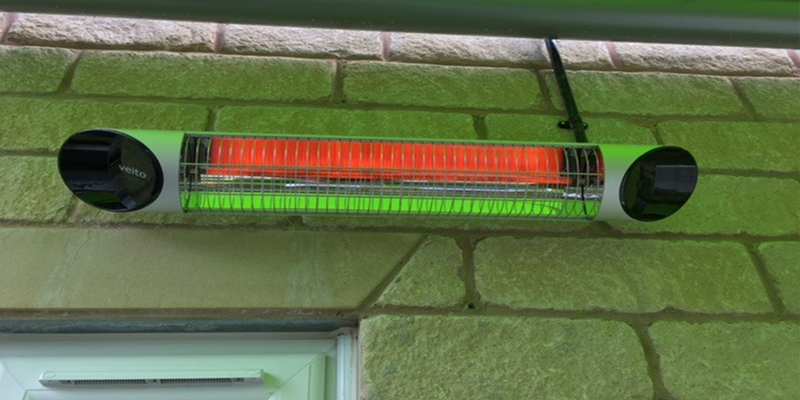 Infrared heaters are available on numerous systems available from Samson Awnings.